For us mainlanders, how about raising tier limits? So the other weekend the Lab had a big sale on estates; waiving the renormous setup fees that they usually charge, for all normal or Homestead estates sold on the weekend. Less gimmicky, and for the benefit of Mainlanders like me who love living in the thick of things, I would recommend that the lab raise the amounts of (main)land that people can own at each level of tier. In the current schedule, for instance, someone paying US$40/month in tier can own up to 8,192 square meters of mainland (plus 512 square meters of tier-free Premium land). At US$125/month, it’s 32,768 (half a sim); at US$8/month, it’s 1024 (one sixty-fourth). Mainland is quite cheap now, 1L per square meter or under in many places without direct water access. And even at that price, lots of it sits around unsold, I suspect because tier is inflexible, and hasn’t gone down with the falling economy like land prices have. One approach would be to just lower the prices at each tier, of course; make it US$30 and US$100 instead of US$40 and US$125, or whatever. I think it might be more interesting to raise the allowed amount of land at each tier, though, and leave the amounts the same. It more or less amounts to the same thing, but psychologically it’s simpler. Someone currently paying US$40 per month and with their tier maxed could immediately go out and buy more land, without having to think about it; whereas if the tier for their current holdings just went down to US$30 instead, they might take that extra ten bucks and buy a fancy new yacht, or even (horrors!) a couple of RL coffees. What would the benefit be to the Lab? In the short run it’s revenue-neutral, in that they are still getting the same tier payments, and all they have to part with is lots of unowned mainland that isn’t doing them any good right now anyway. In the medium term there’s some opportunity cost, as some people who would have decided they really did want more land and tiered up won’t do that, since they can have more land now without paying. But on the other hand there are also more sales of Lindens as all those people who now have more land go out and buy stuff to put on it. In the long term, I like to think that having that land occupied by people who will be doing interesting things with it, rather than lying fallow and empty, will draw more people to the mainland, and to SL in general. Retention is likely to be higher if people see interesting things than if they see empty abandoned or For Sale land. And that’s certainly a benefit. So I looked at the Picks of a random interesting person met at Originalia, and went there (it was very neat, but I’m not weblogging it right now), and then she arrived also and we IMd a little, and she recommended another interesting place, and it was like wow. This is only a few of the pictures I took; a few more are in this flickr set I made for them. It has little dancing and cuddling spots, a sailbaoat you can sail, a couple of small art galleries, lots of gorgeousness to look at; it even has its own Facebook page! I got an invitation to, and then got confused about dates and so missed, a blog-o-sphere preview of tomorrow’s opening of a three-artist show on the Originalia sim. But I have snuck in :) between the preview and the opening, and can confidently recommend that you go. Here is also Chestnut on the show. ‘Travel to Originalia’ is the newest art exhibit on Amase Levasseur’s Originalia sim. The show includes three exciting exhibits by award winning artists. 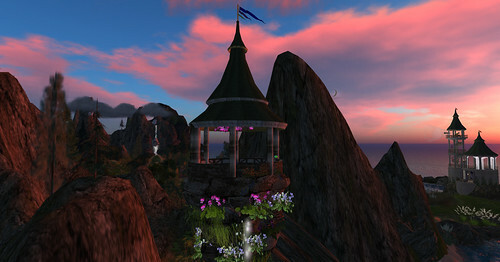 In keeping with the theme of the sim, the exhibits include fresh new work that has never been seen before in Second Life. ‘Travel to Originalia’ includes “Postcards Home” by Callipygian Christensen, “Adapt or Perish” by Cherry Manga and “Gateway to Hell” by Fuschia Nightfire. As a special treat, visitors will also be treated to a reprise of the much loved exhibit “The Docks” by Scottius Polke. 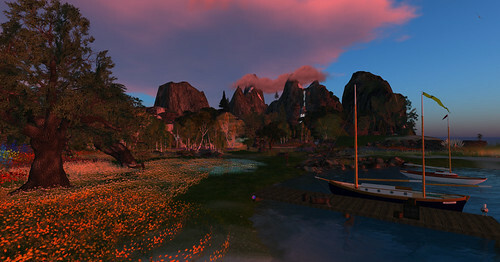 Follow the SLurl below and enjoy your “Travel to Originalia”. All of the creations are well worth a visit. Calli Christensen has some lovely SL landscapes intriguingly cast as postcards home (we only get hints of what’s written on the backs), and “Gateway to Hell”, “Adapt or Perish”, and “The Docks” are all, well, not to spoil the experience… all builds eminently worth seeing. So go! Tomorrow at 1pm or later, that is! So I’ve been meaning to do a weblog posting about Carriage Trade forever (I have some really nice pictures), and this still isn’t it :) but I got a chance to ride on a very cool Steam-Horse, and I got pictures of that, too. 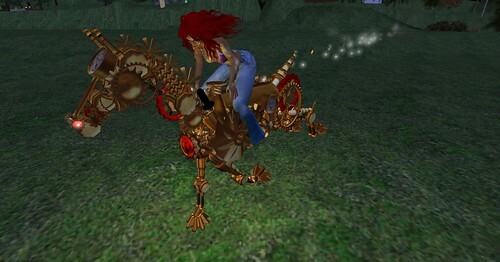 The horse is actually an AV (and I am riding it through the usual trick of that we are actually both sitting on a rezzed invisible vehicle), so one can also have fun being the horse and riding around solo. In the background of that shot, you can see another rider, riding an also very impressive skeleton horse. (Even further in the background you can see my Dreamliner parked over the Park, and not quiiite rezzed yet.) 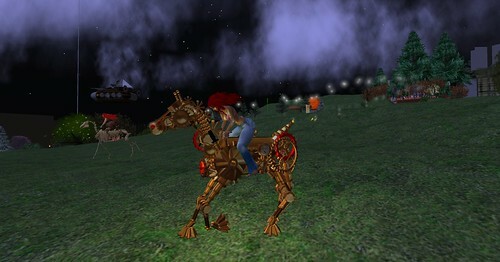 These horses and various other Hallowe’enish and otherwise things can be found at Carriage Trade North. So normally I go barefoot (or in socks if it’s chilly) in SL, sort of like in RL, because well really why not, and especially heels make my feet hurt. But well I’ve been on sort of a clothing-acquiring binge for a few days now, as mentioned in the previous post, and somehow this led to my acquiring some very (very very) nice boots. I mentioned this on Twitter, and a certain fictional character (John Carter, Mars, get it?) had the nerve to demand evidence. Silvana tights (in Forest) and Lavinia top (in brown, with feather collar) from Kunglers. Amazing BAX Prestige boots, also in brown, also from Kunglers. Silvana tights (in Forest) again and Lavinia top (in brown, feather collar off this time) again, the latter mostly hidden by the lovely Brigitte knit coat in Moss. And the amazing boots again. I can’t usually wear high-waisted stuff like this, but somehow in glorious warm earthtone knits I adore it. The boots are amazing not just because they look so grrrrrr, but also because they have like a zillion options and things, including optional walking sounds, two different optional AO walks, being able to have the sleeve at the top up or down, or put on rolled-up denim for wearing with jeans, and four different basic brown shades and the ability to recolor like every tiny little detail. Lavinia top again, this time with adorable little Gigi sequined shorts (skort?) in Garnet (from Kunglers yet again), and with the boots set so that the zipper and edge details are in metallic gold, and the soles largely in red. Not only do the boots make me six inches taller (six foot three, yipes!) and maybe a little hawt (blush), but with these shorts my legs look, like, five miles long. Oh, and if it occurs to you that I don’t generally have nearly this much fashion sense, you’re entirely right. :) Introduction to Kunglers, as well as quite specific suggestions on what would look good, are all owed to v nice an’ well-dressed friend Michele again (in fact as I recall this latest burst of acquisition was because I admired the Brigitte knit that she was wearing (hers in purple), and she said, ya know…). That’s the red gown that’s the final bonus prize, plus the hat from the first of the three stores. The other two stores have matching tops and bottoms in the same color scheme that make up a fun casual outfit in Hallowe’en colors. I madly lurve this outfit. It comes with like three different skirts in various lengths, two different pairs of wings (one of which drops these lovely autumn leaves constantly), and this gorgeous top (which is actually a separate shirt and jacket, either of which can also be worn alone). It’s “Fall Fairy”, from Angelwing (or Angelwings? I forget). It was only like 200L! And in various of those places I bought various other random things, some of which I haven’t even gotten around to trying on yet, and my inventory is even bulginger than ever. But it is fun! The secret is out! “Placemaker: Plazas” released to worldwide acclaim! Well, I’m sure there will be worldwide acclaim soon, anyway. Probably! 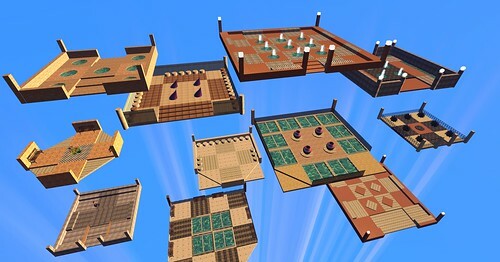 There is the publicity shot for Placemaker: Plazas (Basic Edition), just released onto the SL Marketplace. For a mere 400 Linden-dollars, you can own a device capable of producing literally a whole lot of different and sometimes even interesting (and in any case full-perm) plaza-like structures! I have no doubt if that price-point makes any sense :) but I thought I’d give it a try.